Last year was an historical one for Ethiopian politics. Most Ethiopians now feel hopeful about the prospect of peace and democratic progress. This is despite the fact that the ruling Ethiopian People's Revolutionary Democratic Front - which has a long history of authoritarianism - is still in power. Nonetheless, a new progressive leadership with Prime Minister Abiy Ahmed at the helm, and a series of reforms he's introduced, could mean that the ruling party of old is gone for good. Ethiopia's ethnic federalism has historically pitted one ethnic group against the other. Over time, political manoeuvrings empowered the elites who were member of the four parties that formed the ruling coalition. Together, the leaders of these groups have navigated Ethiopia's political terrain for over 27 years. They ensured that opposition leaders were jailed, or were otherwise unable to participate in the narrow political space. The only hope of challenging the political status quo lay with the electorate. Ultimately, a massive wave of protests across the two most populous regions of the country, Amhara and Oromia, ensured that the political days of the Tigray-dominated ruling coalition were numbered. Attention quickly shifted to the idea of a new political leadership. But which force could replace the authoritarian Ethiopian People's Revolutionary Democratic Front? The first major crack within the Ethiopian People's Revolutionary Democratic Front coalition was a series of disagreements between the Amhara Democratic Party and the Tigray People's Liberation Front since 2014. The top leadership from the two parties differed on the general direction the country was taking. In addition, the Amhara wing questioned the dominance of the Tigrayans within the ruling coalition. These national party wrangles trickled down to the Amhara and Tigray administrative regions and as rivalries grew, the Amhara leaders, led by Deputy Prime Minister Mekonnen, made it clear that the Tigray front's interference in Amhara regional state matters would not be tolerated. Such inter-coalition infighting's were taking place since 2014. At this time, the Oromo Democratic Party was also embarking on radical internal reforms. Members deemed to be serving the interests of the Tigrayan party dominating the coalition were ousted. The Oromia Region president, Lemma Megersa, and his then deputy Abiy, quickly established a close partnership with reform leaders within the Amhara Democratic Party, a group that was led by Mekonnen . Mekonnen has been Ethiopia's deputy premier since 2012. Desalegn's abrupt resignation was welcome news and focus quickly shifted to his replacement. 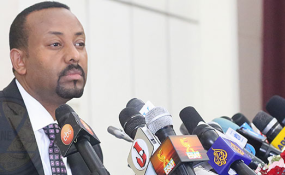 Because Abiy was a member of Parliament and therefore eligible to become head of government, his party members elected him to the post of ODP party chair. From there he was voted in as Ethiopia's third prime minister in the ruling coalition's era, and the first Oromo ever to hold the position. Mekonnen, who had supported Abiy's rise to power, became his deputy. Since then the two have had a series of reform successes. Ahmed also needs to contend with the recently revived Oromo Liberation Front, a rebel group that is refusing to disarm. The fact that the administration has opted to take military action against this group is an unusual development in the current climate, and an indication that Ahmed's patience for dissent could be waning. Moreover, the political violence in the restive Ethiopian Somali region also remains active. Amid the volatility, Abiy's administration needs to devise working strategies that could calm the situation down. This is something to watch. Regardless, Ethiopia's historic journey towards fully fledged reform seems intact, and popular support for the steps being taken by the administration remains high. Yohannes Gedamu is lecturer of Political Science at Georgia Gwinnett College’s School of Liberal Arts. His doctoral dissertation is entitled: Ethnic Federalism and Authoritarian Survival in Ethiopia. Dr. Gedamu expertise focuses on Sub-Saharan Africa in general and the Horn of African countries in particular. Topics of interest are: Democratization, Authoritarian survival, Ethnic Politics, Federalism, and Cross Border Societies in the politics of cooperation or discord.